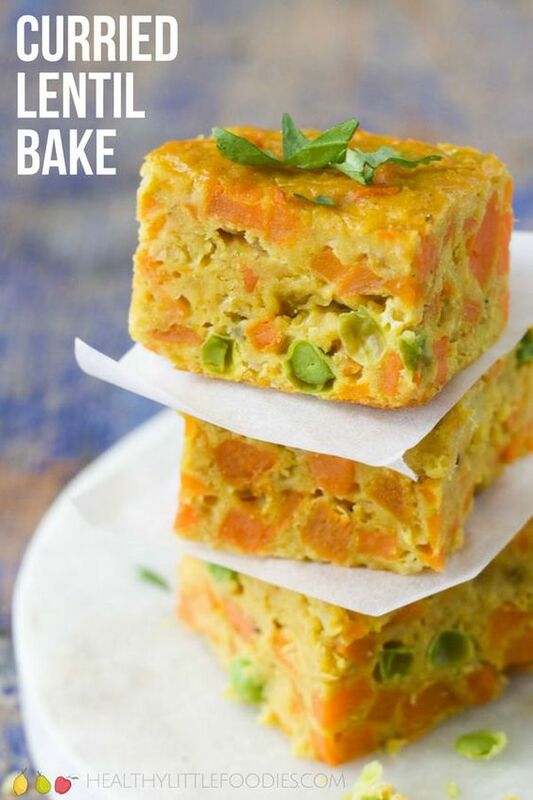 Lentils cooked with vegetables, egg and sweet potato to make a perfect baby and kid friendly bake. Cut into bite size pieces and pack any left overs into a lunch box. Once lentils are cooked, allow to cool slightly and then add the potato, egg and peas. Stir until combined. Bake in the oven for 30-40 mins or until set and golden (mine took 35 mins) but timings will vary with ovens. Slice into squares. I cut into 20 pieces. * If your children do not like curry flavour then miss this out. You could always add some freshly cut herbs before baking in the oven. **If serving to a baby or young children use homemade stock or very low salt stock. Nutritional information is an ESTIMATE only and is calculated using an online calculator. The facts are based on 1 of 20 squares. Facts will vary depending on the brands of ingredients used and size of vegetables. 0 Response to "Curried Lentil Bake"